Emma moved to Cambridge from Crawley, West Sussex in 1997 to attend Anglia Ruskin University. After working at the Dobblers part time for 4 years during her studies she took over The Dobblers as manager in July 2002. She secured the pub tenancy in December of the same year with her then partner Dave. Hugo the Staffie joined the team in 2007 and is now sure he is the boss of all he surveys! Dave left the pub trade in January 2014 to pursue other avenues but Emma continues to offer traditional pub values and a jolly good time to the people of Cambridge! Emma, Hugo, all the staff and regulars welcome you into their home and hope you will enjoy your visit. 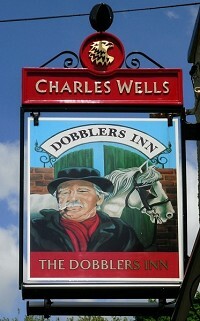 The Dobblers Inn, formerly The City Arms, was taken over by CAMRA Investments in 1982 and renamed in 1984. We believe the name is taken from an old local area called 'Dobblers Hole' which is located roughly in the Beehive / St Matthews Gardens area just behind Sturton Street. In the Cambridge Evening News there was a reference to this area, calling the "dobblers hole, a rubbish strewn, rag and bone yard". It also stated that "some older residents could remember a colourful and eccentric character called Dobbler who kept a large rag and bone yard, renowned for unusual items". We think this is where the design of our pub sign originates. "A Dobbler" has also become a slang term, "as a person with low standards who lacks motivation" or " someone who consumes other peoples' food and drinks before their own". We like to think that a modern day dobbler has grown to mean someone who is friendly, loud and outgoing, who thrives on community life whilst socialising in a relaxed environment. You will certainly still find some 'colourful, eccentric and unusual characters' frequenting this drinking hole!